20 “I ask not only on behalf of these, but also on behalf of those who will believe in me through their word, 21 that they may all be one. As you, Father, are in me and I am in you, may they also be in us, so that the world may believe that you have sent me. 22 The glory that you have given me I have given them, so that they may be one, as we are one, 23 I in them and you in me, that they may become completely one, so that the world may know that you have sent me and have loved them even as you have loved me. 24 Father, I desire that those also, whom you have given me, may be with me where I am, to see my glory, which you have given me because you loved me before the foundation of the world. A friend of mine recently made a print of this icon depicted above with the phrase “As we are one” underneath it. The original was created by Russian iconographer Andrei Rublyov in the 15th century. It is meant to depict the Trinity, as he interpreted the visiting of the angels to Abraham and Sarah as a theophany, or revealing of God in the three persons of the Trinity. Now, the print sits on my prayer altar in my home study, a reminder of the invitation and prayer of Jesus for people like me: that we would be one with other followers of Jesus and that this oneness would be same sort of unity as experienced in the Trinitarian life of God. No small prayer, to be sure. Since beginning my studies at St. Mary’s Ecumenical Institute, my desire to see and embody more expressed unity in the Church has grown. I have had the privilege of learning alongside sisters and brothers from a variety of streams and traditions. I have been challenged, encouraged, sharpened, and blessed by this experience. In short, I think I have had a deeper encounter with this Trinitarian life of unity for which Jesus is praying. As much as we catch glimpses of unity and deepened relationships with other Christians, we often see much expressed disunity. We have become professionals at fragmenting the Church and building walls around our respective denominations and tribes. If we are to take Jesus’s prayer seriously, this lack of unity is missionally irresponsible. Jesus connects our expressed unity to whether others will believe that Jesus was sent by God to love the world. Where can we join God in the movement of love toward others? The mission of God to love and redeem the world is rooted in God’s own life of unity. God is interested in bringing all that is not God into communion with God. This is God’s mission. What might it look like for us to participate in this life of unity, which is available to us as those who are in Christ. I don’t think it would matter who you ask, most people would say that relationships matter. However, we could also all name at least on relationship that has not gone well. Some of us are in the midst of relational struggle right now: a family member, a friend, a coworker…perhaps you are really struggling in your relationships with your neighbors or people in the city. Some of you have become hardened to those in need around you. And maybe some of us are really struggling with our relationship to God. We have questions and doubts. Some of you may be angry with God or feel slighted by him. So, as much as we would say relationships are important, we would also be quick to say that we have a lot of struggles and room to grow in how we relate. As we have said regarding our other values, it is not enough to simply say you value something: there is a way in which we must value them. Which relationships do you value? How do you value those relationships? Relationships matter first with God through His son Jesus and then with people. A relationship with Jesus is the only hope for a lost and broken world. When Jesus was asked what the greatest commandment was, His response was simple: “LOVE GOD, and LOVE PEOPLE.” We value the image of God in all people. We believe that we were created to live connected with one another: carrying each other’s burdens, sharing our possessions, praying for and confessing our sins to each other, and suffering and celebrating together. It’s in these honest, loving relationships that God transforms us and His Love is brought to full expression through us. The way of Jesus cannot be lived alone. Our model for relationship is always Jesus, so we can use an example from his life as a framework and talk about some other scriptures on the way. In fellowship with the Father. Jesus was in fellowship with the Father as a matter of priority and necessity. He prayed regularly. In this passage he prayed all night He always had sufficient time alone with his Father daily. Jesus was often at prayer before the disciples woke, he went out to lonely places to pray, and says he can do nothing by himself without the Father. Prayer, praise and waiting on his Father were fundamental elements in the lifestyle of Jesus. Jesus was in constant contact with His Father, whom He spoke of in very personal and familiar terms. We do not get to the point of calling our Father Daddy (Abba) without spending significant time with him and experiencing the love and care that he has for us. So how do we move UP? When is that last time you enjoyed God? Not his gifts. Not his words. Not ideas about him. HIM?We immediately tend to think that we need to schedule all of this time and do devotions 7 times a day and read the Bible in 30 days and so on… I encourage you to recognize the fact that, as a follower of Jesus, God is with you and inside of you right now. Right now. And all of the time. What can you do to notice him, to enjoy life with him? It may mean taking time to get up early. It may mean taking time to get away to hear his voice. We will talk more next week about prayer; how to communicate and commune with God. This is where I have the biggest room for growth. But I know it is necessary to be able to have thriving relationships. When I say “in” I don’t mean in to ourselves, I mean in with each other. This is about relationships with each other as a church family. Again, Jesus is our example. If there was anyone who could have gone it alone, Jesus may have been the best candidate. But he didn’t. There was no such thing as “me and the father only” for Jesus. After prayer (up), Jesus calls the twelve to become his disciples (in). Mark 3:13-14 says that he called to him “those he wanted” “that they might be with him”. Jesus was fully human; a social creature. He needed to be with other people. Jesus did not do life alone! He wanted to spend time and build strong relationships with them, which he did over the three years he lived with them. Jesus came as a human being and showed us the way human beings are to live out their lives. We are not complete as individuals. We are creatures who need the Inward dimension. We need each other. As Mike Breen says, “the smallest indivisible unit in the kingdom is two”. Jesus never sent out people by themselves. As best as I can tell, the only one who did anything by himself was Judas…not a great example. This is why the believers didn’t simply hear the message and then continue on as if nothing changed or embrace some sort of “personal relationship with Jesus” that included no one else.. The Acts 2 text shows us more about this communal life. They met together daily. They worshiped in the temple together. They shared meals together. They shared their possessions as each one had need. They sold their stuff and gave the money away to a brother or sister. This is a radical move toward community. And, in general, we (as people) are terrible at doing this. The largest reason is because we do not know how to be authentic and vulnerable with each other. We struggle to share our lives with one another; our true selves. That’s why we are going to take an entire sermon to deal with this on the 30th. So, please do make time to be here that week. I actually think that if we don’t get the “in” part right, we cannot do mission well. After Jesus prayed to His Father (UP), he created a team of people to work alongside him and be company with him (IN). He then moved into and amongst the crowd and embodied the kingdom, proclaiming the good news and healing the sick. This pattern is revealed in the life of Jesus: in order to be obedient in mission, we first need to be in deep, abiding relationship with the Father, then with one another before being able to move out into mission. So, moving out: what does that look like? Acts 2:43, 47 Awe and favor with the people around us. We do not go out alone. This is disobedience.The call is not to go by yourself. You will get hurt. Jesus sent out his disciples in groups of 2 for a reason! Our relationships with each other and our mission in the world are rooted in the very nature of God. 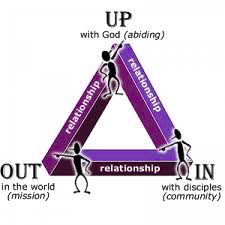 If we go back to the triangle, and we will see that the Triune God is active in each one of these dimensions. Up (Father), In (Son), Out (Spirit). To experience life in these three dimensions is to experience the fullness of the Trinitarian life and mission: a God who is constantly moving within and without. This the THE fellowship: it is the relational life that God creates by virtue of his love. The early church fathers had a name for this: perichorisis: the dance of the Trinity. His mission is to continually bring all that is not God into closer fellowship or communion with him. So we cannot have relationships working at their best apart from God. We come to understand love and sacrifice and family as we are brought into relationship with him. This week, may we devote ourselves to the fellowship: the relationships that God has created as an extension of himself. May we move up toward the Father in worship and communion, in with each other as the body of Jesus Christ, and out in mission, empowered by the Spirit to see the renewal and redemption of the entire creation under the Lordship of Christ. Would love your thoughts and comments!